This IBM® Redbooks® publication demonstrates and documents that the combination of IBM System x®, IBM GPFS™, IBM GPFS-FPO, IBM Platform Symphony®, IBM Platform HPC, IBM Platform LSF®, IBM Platform Cluster Manager Standard Edition, and IBM Platform Cluster Manager Advanced Edition deliver significant value to clients in need of cost-effective, highly scalable, and robust solutions. IBM depth of solutions can help the clients plan a foundation to face challenges in how to manage, maintain, enhance, and provision computing environments to, for example, analyze the growing volumes of data within their organizations. 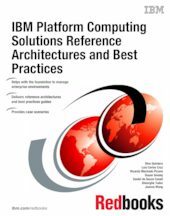 This IBM Redbooks publication addresses topics to educate, reiterate, confirm, and strengthen the widely held opinion of IBM Platform Computing as the systems software platform of choice within an IBM System x environment for deploying and managing environments that help clients solve challenging technical and business problems. This IBM Redbooks publication addresses topics to that help answer customer’s complex challenge requirements to manage, maintain, and analyze the growing volumes of data within their organizations and provide expert-level documentation to transfer the how-to-skills to the worldwide support teams. This IBM Redbooks publication is targeted toward technical professionals (consultants, technical support staff, IT Architects, and IT Specialists) who are responsible for delivering cost-effective computing solutions that help optimize business results, product development, and scientific discoveries.